Add some variety to your favorite crispy breakfast treat. The same great lean, crisp and rich natural meaty flavor of our cob-smoked bacon with an added touch. This new recipe adds a fine coating of maple syrup and maple sugar just after we smoke it. The result: Pure Heaven! I buy this product as often as I can afford it. I LOVE it! I would like to buy more maple bacon slices and maple sausage again int the future. I love the perfect sweetness and it is hard not to cook the whole package because it's that good! 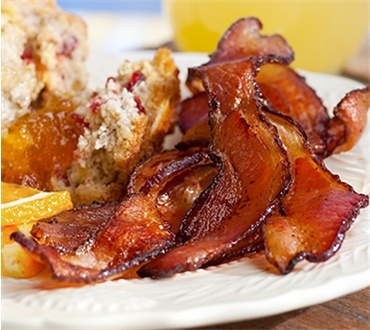 Just when you thought great bacon couldn't be improved upon, Dakin delivers this breakfast superstar! Authentic touch of maple puts this product a head above the imitators.